In the past decade, there has been a rapid increase in the inflow of entrepreneurs into the city. 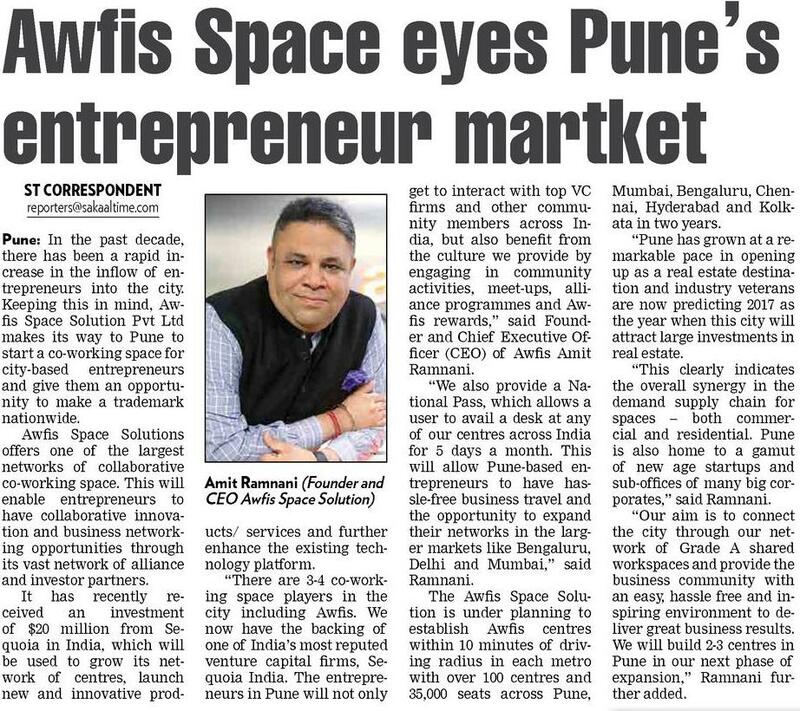 Keeping this in mind, Awfis Space Solution Pvt Ltd makes its way to Pune to start a co-working space for city-based entrepreneurs and give them an opportunity to make a trademark nationwide. Awfis Space Solutions offers one of the largest networks of collaborative co-working space. This will enable entrepreneurs to have collaborative innovation and business networking opportunities through its vast network of alliance and investor partners. It has recently received an investment of $20 million from Sequoia in India, which will be used to grow its network of centres, launch new and innovative products/ services and further enhance the existing technology platform. “There are 3-4 co-working space players in the city including Awfis. We now have the backing of one of India’s most reputed venture capital firms, Sequoia India. The entrepreneurs in Pune will not only get to interact with top VC firms and other community members across India, but also benefit from the culture we provide by engaging in community activities, meet-ups, alliance programmes and Awfis rewards,” said Founder and Chief Executive Officer (CEO) of Awfis Amit Ramani. “We also provide a National Pass, which allows a user to avail a desk at any of our centres across India for 5 days a month. This will allow Pune-based entrepreneurs to have hassle-free business travel and the opportunity to expand their networks in the larger markets like Bengaluru, Delhi and Mumbai,” said Ramani. The Awfis Space Solution is under planning to establish Awfis centres within 10 minutes of driving radius in each metro with over 100 centres and 35,000 seats across Pune, Mumbai, Bengaluru, Chennai, Hyderabad and Kolkata in two years. “Pune has grown at a remarkable pace in opening up as a real estate destination and industry veterans are now predicting 2017 as the year when this city will attract large investments in real estate. This clearly indicates the overall synergy in the demand supply chain for spaces – both commercial and residential. Pune is also home to a gamut of new age startups and sub-offices of many big corporates,” said Ramani. “Our aim is to connect the city through our network of Grade A shared workspaces and provide the business community with an easy, hassle free and inspiring environment to deliver great business results. We will build 2-3 centres in Pune in our next phase of expansion,” added Ramani.